The Husqvarna 924HV Snow Blower is the entry level snow blower from Husqvarna. As you have probably already guessed it has a clearing width of just 0.61 m (24 inches). At the same time the 924 HV has a relatively high clearing height at o.58 m (23 inches) which enables it to tackle very high snow drifts. 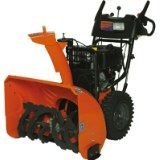 The snow thrower is powered by an LCT engine which gives the machine 9 ft-lbs of torque to play with. The total size of the engine comes to 0.21 liters. Even though this is the entry level model from Husqvarna, it is a dual stage snowblower with both an auger and an impeller to help with getting rid of the snow. The snow first meets the serrated steel blades of the auger when it enters the Husqvarna 924HV snow blower. The auger then chops up the snow very thoroughly before moving it along towards the impeller. The impeller is located at the center of the housing and consists of 3 blades the further chop up the snow as well as forcing it through the chute at high speed. The impeller provides enough force to the snow to hurl it up to 9.1 m (30 feet) from the leaving the chute. The chute on this snow thrower is metal and has a turning radius of 180 degrees. This chute is not operated manually. Instead you can completely control it from the operating station. The engine on the Husqvarna 924HV snowblower is electric started. For this electric starter system to work properly, it needs to be plugged in. The fuel tank on the 924HV snow thrower has the capacity to hold up to 3.8 liters (1 US gallon) of gasoline, allowing for a long operating time before needing a refill. Click Here to buy the Husqvarna 924HV Snow Blower.